Often looking at the identification on the cable sheath will offer clarity. Anyone who buys dewatering pumps should not just focus on the pumping quantity and delivery head. The ability of a pump to withstand the loads it is subjected to primarily depends on its design and components – and these are hidden inside the pump. What are the things to look out for? “Unfortunately, it is very difficult for many users to recognise the quality of an aggregate simply by looking at it,” says Stefan Himmelsbach. A fact known and exploited by dubious manufacturers true to the motto ‘Darkness favours secrets’. The engineering expert at Düsseldorf-based Tsurumi, the market leader in the construction pump industry, presents a brazen forgery from the Far East: Even experts cannot tell the difference from the original at first glance. Himmelsbach recommends taking a close look at the name plate first. “All pumps marketed in the EU must have a name plate”. It states information about the following five points as a minimum requirement: manufacturer, machine designation, type, if necessary with serial number, year of construction and CE seal. “Lots of discounters from abroad are not aware of these requirements”. The electrics are of course a neuralgic point: starting with the cables. “We and other reputed manufacturers use cables that have been certified by the VDE and are safe”, emphasises Himmelsbach. Often looking at the identification on the cable sheath will offer clarity. He makes reference to the Association’s website that lists faulty components and their manufacturers: “This list names the black sheep in the industry”. Tsurumi takes numerous steps to secure its products down to the finest detail. Using approved components is a mandatory requirement. One example that demonstrates how the company goes beyond its normal duty of care are the individually moulded electrical cables in the cable opening: Electrical damage, such as short circuits caused by damp, can be completely ruled out thanks to this hermetic seal. Most top manufacturers, although not all, also opt for quality products even for ‘hidden’ components, according to Himmelsbach. For instance, in the case of slide ring seals on the pump shaft that are absolutely vital for function, Tsurumi purchases double interior versions from the leading manufacturer of these parts. Some components represent the domains of the respective manufacturers. 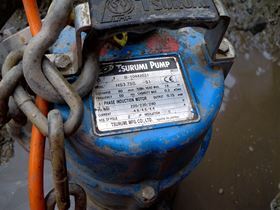 Amongst other things, at Tsurumi this includes the in-house developed oil lifter that has been registered for patent which lubricates the pump to the optimum in every position. This key technology has certainly helped to ensure that Tsurumi has become the world’s leading manufacturer of contract pumps. Himmelsbach’s advice: “Users should only buy products from specialists after extensive consultation.” There are also secondary factors that are very important, like the scope of the delivery program (at Tsurumi 800 pump types), repair-friendliness (modular design) and the service network (250 distributors in Germany alone). He concludes: “If reliability, accident protection and service are important, always opt for a reputed supplier of brands”.